Vale of Disappointments - so might be called the beautiful spot which is known by the name of Makoniky today, for nowhere on the Vineyard is any place where such a number of enterprises have been established only to fail. The sign directing travelers to the spot is seen on Lambert’s Cover road and to those who follow the dirt cart path down through the woods is afforded the view of a rolling slope down to the sea. A large hotel and several cottages stood upon the high ground, all looking empty and forlorn, while the westward stands a brick smoke stack and the office building of a plant, some traces of which yet remain. Scrub oaks and brush have overgrown what was once a smooth lawn and the beach may be reached only by following the road kept open by picnickers who frequent the place through the kindness of the present owner. There is nothing sinister or forbidding about the appearance of Makoniky, nor is there any dark chapter in its history. On the contrary, the great field is beautiful, the hills commanding a superb view of Vineyard Sound and its distance from the highway insuring quiet and peace, while the natural land formation offers building sites of excellence. Still, the brush and empty buildings give the place an atmosphere of desolation. Considerable has been recorded concerning this general section which was called by the Wampanoags and early white Chickemmoo. The name Makoniky, spelled in various forms occurs in a number of places in old records and is thought to mean “broken or ploughed ground,” by which may have been meant that this was a cornfield. At the time of Chilmark’s settlement, Chickemmoo was a part of that town and continued to be so for about 136 years. The first principal landowner in this district was Isaac Chase who purchased several large tracts of land, the purchases dating from 1681 until 1698, the last purchase lying immediately west of a tract owned by Ephraim Savage of Boston, whence comes the well-known boundary, Savage’s Line, which is used today. As the property now known as Makoniky lies on both sides of Savage’s line, it serves to locate the spot with reference to early owners. Apparently there is considerable doubt as to whether Isaac Chase ever lived at Chickenmmoo; Savage himself, being described as a speculator, evidently never lived on the Island at all. Chase purchased his first large holding from the Sachem Josias on August 15 of the same year and this tract of other purchases added thereto included Makoniky. Who the “mann well proved Among men” might have been is not known. There is a record of John and Joshua Daggett living in a house built upon their mother’s land before 1688, but this property was also purchased by Chase. Various transfers of property and much bickering over bounds occurred during the next few years which resulted in the entire removal of families from this section, so that in 1700 there were but two known families resident in Chickemoo, John Daggett’s and Thomas Butler’s, comprising 20 souls. The population increased rapidly, however, and in 1750 there were 150 persons living in the district, but long before that the people had wearied of the inconvenience caused by living in a town the village of which was so far removed. It was in 1736 that David Butler, Ichabod Allen and others prepared a petition: “Shewing that they live Eight miles from meeting house in said town (Chilmark) and but four from Tisbury meeting house which they must pass by in their travell to Chilmark; and therefore praying that the whole tract of land called Checkamo with their inhabitants and estates may be sett off from Chilmark and annexed to the town of Tisbury.” This petition was granted by the General Court on Dec. 30 of that year. Of the tract of land now known as Makonikey, it, included in various other purchases, was successively owned by various persons during the next 150 years. The list of those who probably owned portions of the hotel property, are Isaac Chase Jr., Henry Luce, Ichabod Allen, Samuel and Zaccheus Hatch, Joshua Weeks Miller, Samuel Coffin, Joseph Parker, and Thomas Smith, who divided his holdings into three parts, apportioning one to each of his sons, Thomas, Nathan and Ransford. Through the death of these last-named owners, the property was sold out of the family, and in 1893 was owned by Alfred Norton, John A. Luce and the heirs of Elisha Lambert. It was from these people that a 450 acre tract was purchased by the Makoniky Hotel Company, which tract, still intact, is now owned by Roger W. Higgins of Brookline. Lying on both sides of Savage’s Line there is a long shorefrontage and the property extends back into the hills for a half mile or thereabouts. Upon the highest elevation the company built a hotel containing about 30 rooms, and nearby erected a stable, laundry and a steam plant for supplying the buildings with water. A large wharf was also built, and the Island steamers stopped there twice daily during the summer. The land was cleared all around the hotel, with the exception of certain small groves of trees and was laid out in streets, avenues and building lots, while a magnificent lawn sloped away from the hotel down toward the water. From inland, nothing of the place could be seen until the observer had approached very close, while from the sound it looked like a picture, too beautiful to be real. The hotel opened and was filled with guests almost at once and all seemed promising for the new company. But their money was running low and that fact was the underlying cause of the first failure. A gang of Italian laborers was employed at grading and clearing the land and the company lacked money to pay their wages. Fearful of being defrauded, the workmen went to the hotel in a body one night and demanded their money. When the realized that they were not likely to get it, the threatened to burn the hotel. The guests, who had been attracted by this unusual demonstration, became panic-stricken and left the place, swarming into Vineyard Haven in the dead of night, beseeching assistance and shelter. This ruined the season and eventually ruined the company, for it gave the place a bad reputation, and although it was opened twice more, the company met with no success and at length the property was taken over by the bondholders. 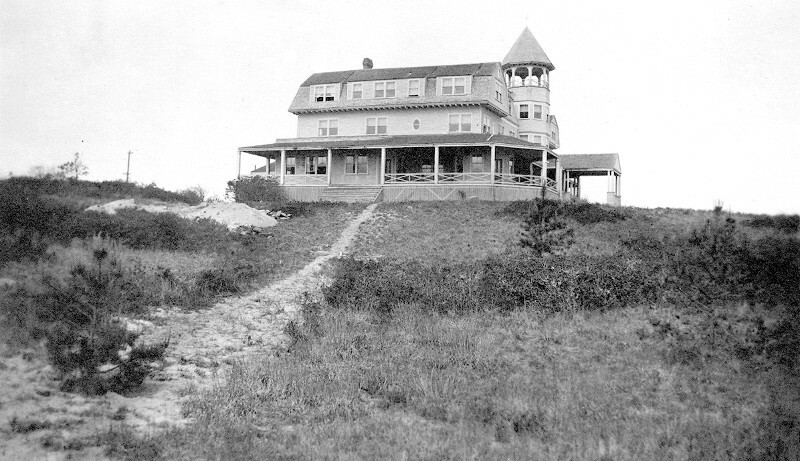 Three years after the hotel was built, the property was acquired by a Maine lumber dealer who had held some previous interest in the company. He shipped lumber to Makoniky and built fourteen cottages around the hotel and attempted to attract visitors to the place, but this venture also failed. Six or seven years later, George a Matthews, a retired preacher and his son Roy came to Makoniky, and after boring in the clay beds, established the Augusta Clay Company. A few vessel loads were shipped, but the Matthews were unsuccessful. The China Clay Company was then formed and after elaborate apparatus had been installed, operated for about a year and failed as the previous company had done. A brick-making plant was then built, and a fortune spent in machinery and apparatus. Everything of the very best was supplied to make the plant thoroughly up-to-date and efficient. Tracks were laid from the plant to the wharf and cars drawn by a locomotive were used to haul supplies to the plant and the bricks to the shipping point. Flower pots, heavy earthenware and vases were moulded and fired there, and when a vein of lignite was discovered, it was announced by Matthews, who still retained an interest, that it was soft coal, and that the company would be independent of any expense for fuel, either for power or the kilns. It was soon found, however, that the lignite, even when mixed with soft coal, would not produce sufficient heat for the burning of bricks or other earthen products, and after struggling along for five years this company also went to the wall and the plant was closed. In 1913 the Young Women’s Christian Association leased the hotel and several of the cottages for five years, and Makoniky sprang to life once more with the arrival of some 300 girls and young women who spent the summers there. In the meantime the World War created an acute demand for machinery and metal products and the plant was purchased and wrecked, little remaining today besides the brick stack, for even the water mains were dug up and shipped away. Eight of the cottages were also sold and moved to other sites, but enough remained to attract the Y. W. C. A., which society intended to purchase the property. Repairs and improvements of a permanent nature were made by the society on the strength of their intention, but for some reason the plan was abandoned, and the property was purchased instead but its present owner, Mr. Higgins. Such is the history of Makoniky, one of those spots which have attracted men from the beginning of things, yet which is today a deserted village rapidly being reclaimed by nature. The hotel tower looms above the trees and several of the cottages still among groves. Off to the westward rears the chimney of the brick-making plant and the great wharf still stands, jutting out from a smooth beach. But the smooth slopes of the hills are hidden with brush, the shingles and clapboards are missing from the buildings in many places, and the empty windows look out upon a wild tract, wilder in all probability than that which the Native Americans knew. Owls and bats find a haven beneath the porches and eaves and picnic parties travel down past the hotel to the beach, but none tarry in this place, which might be likened to one of Arizona’s “ghost towns,” built in a month about a “strike” and deserted when the vein ran out. Yet the place is filled with sunshine and cheer. The thickets are alive with singing birds and the prevailing storm winds never rake this spot which seems always to be waiting with outstretched arms to welcome someone who shall there find happiness and contentment.